2. Service de Médecine Nucléaire - CHU de Bordeaux; UMR-CNRS 5287; LabEx TRAIL; Université de Bordeaux, FRANCE. PURPOSE: Radionuclide therapy is increasingly seen as a promising option to target minimal residual disease. Copper-67, scandium-47 and terbium-161 have a medium-energy β- emission which is similar to that of lutetium-177, but offer the advantage of having diagnostic partner isotopes suitable for pretreatment imaging. The aim of this study was to compare the efficacy of 67Cu, 47Sc and 161Tb to irradiate small tumors. METHODS: The absorbed dose deriving from a homogeneous distribution of 67Cu, 47Sc or 161Tb in water-density spheres was calculated with the Monte Carlo code CELLDOSE. The diameters of the spheres ranged from 5 mm to 10 µm, thus simulating micrometastases or single tumor cells. All electron emissions, including β- spectra, Auger and conversion electrons were taken into account. Because these radionuclides differ in electron energy per decay, the simulations were run assuming that 1 MeV was released per µm3, which would result in a dose of 160 Gy if totally absorbed. RESULTS: The absorbed dose was similar for the three radionuclides in the 5-mm sphere (146-149 Gy), but decreased differently in smaller spheres. In particular, 161Tb delivered higher doses compared to the other radionuclides. For instance, in the 100-µm sphere, the absorbed dose was 24.1 Gy with 67Cu, 14.8 Gy with 47Sc and 44.5 Gy with 161Tb. Auger and conversion electrons accounted for 71% of 161Tb dose. The largest dose differences were found in cell-sized spheres. In the 10-µm sphere, the dose delivered by 161Tb was 4.1 times higher than that from 67Cu and 8.1 times that from 47Sc. CONCLUSION: 161Tb can effectively irradiate small tumors thanks to its decay spectrum that combines medium-energy β- emission and low-energy conversion and Auger electrons. Therefore 161Tb might be a better candidate than 67Cu and 47Sc for treating minimal residual disease in a clinical setting. Keywords: Dose, radionuclide therapy, minimal residual disease, micrometastases, terbium-161, copper-67, scandium-47, lutetium-177. Targeted radionuclide therapy relies on the administration of radiolabeled compounds to irradiate tumors . Iodine-131 has been used since seven decades to prevent recurrence of thyroid cancer after surgery and to treat distant metastases [2-4]. In the past years, several other tumor-targeting radiopharmaceuticals, labeled with iodine-131, yttrium-90, or lutetium-177, have successfully entered into clinical practice. Examples include 131I-MIBG for neural crest tumors, anti-CD20 antibodies (e.g. 90Y-ibritumomab tiuxetan) for lymphomas , the somatostatin analogs 90Y-DOTATOC and 177Lu-DOTATATE for neuroendocrine tumors  and more recently 177Lu-labelled PSMA ligands for metastatic prostate cancer . Notably, an ever-increasing number of preclinical studies and clinical trials aim at using radionuclide therapy to treat minimal residual disease: i.e. as adjuvant therapy or for consolidation after remission [8-13]. Many of the novel radiopharmaceuticals for targeted therapy have been armed with lutetium-177 [6-9]. 177Lu can be stably chelated to various peptides and antibodies . Compared to the high-energy electrons of 90Y, the medium-energy β- emission of 177Lu allows for a more effective irradiation of small tumors and is associated with a reduced non-specific toxicity [15-18]. Both characteristics are important in the perspective of targeting minimal residual disease. Moreover, 177Lu emits γ photons which enable post-therapy imaging. Three other promising medium-energy β- emitters are: copper-67 [19,20], scandium-47 [21,22] and terbium-161 [23-25]. Their half-lives are suitable for targeted radionuclide therapy with peptides and antibodies (Table 1). The half-life of 161Tb (6.91 d) is similar to that of 177Lu (6.65 d). The half-lives of 67Cu and 47Sc are shorter (respectively 2.58 d and 3.35 d) and thus they might be used to label molecules that exhibit a more rapid washout from tumor tissues. Just like 177Lu, 161Tb is a radiolanthanide that can be stably linked to various molecules using for example DOTA as chelator [24,25]. Chelators that are suitable for stable coordination of copper and scandium are also available . All three radionuclides are amenable to imaging thanks to some gamma photon emissions (Table 1). Photons from 67Cu and 47Sc (184.6 keV and 159.4 keV, respectively) are better suited to post-therapy imaging with gamma cameras than the photons emitted by 161Tb (whose energy of 74.6 keV is similar to that emitted by the myocardial imaging agent 201Tl). On the other hand, the lower proportion of photon emission of 161Tb (~15% of the total emitted energy, compared to ~40% for 67Cu or 47Sc) minimizes total body dose and allows for treatment on an outpatient basis. One major advantage of these radionuclides over 177Lu is the theranostic potential, i.e. the availability of β+ (64Cu, 43Sc, 44Sc, 152Tb) or γ-emitting (155Tb) radioisotopes that enable PET or SPECT pre-therapy imaging and dosimetry [26-30]. Table 2 summarizes the physical properties of these diagnostic radionuclides. The biodistribution of the molecule labeled with the diagnostic radionuclide is expected to faithfully match that of the therapeutic molecule. The aim of this study was to compare the effectiveness of 67Cu, 47Sc and 161Tb at irradiating small tumors. Using the Monte Carlo code CELLDOSE [31,32], we assessed the dose deposits from these radionuclides in spheres of various sizes, simulating micrometastases and single tumor cells. The absorbed dose in each sphere was assessed with Monte Carlo simulations by taking into account all electron emissions: β-spectra, conversion electrons (CE) and Auger electrons (including Coster-Kronig electrons). Emission data were obtained from the International Commission on Radiological Protection (ICRP) publication ICRP-107 . Photons were neglected. For all simulations, the distribution of radioactivity within spheres was assumed to be homogeneous. This was achieved by random Monte Carlo sampling throughout the sphere volume using a high number of simulations (≥ 1,000,000 per sphere). Decay characteristics of 67Cu, 47Sc and 161Tb are reported in Table 1. The spectra of electron emissions are shown in Figure 1. Radionuclide characteristics (see also Figure 1 for electron emission spectra. * Conversion and Auger electrons with probability <0.0001 were neglected (30). Physical characteristics of the diagnostic radionuclides 64Cu, 43Sc, 44Sc, 152Tb and 155Tb. § Photon emissions following β+ annihilation are not considered. Electron emissions of 67Cu, 47Sc and 161Tb. β-spectra are in red (integral of the curve = 1), conversions electrons (CE) are in blue and Auger electrons (including Coster-Kronig electrons) in green. Conversion and Auger electrons whose probability was <0.0001  were neglected and are not represented. Event-by-event electron track simulations in CELLDOSE are based on the cross sections of the interactions between the electron and the water molecule, and take into account ionizations, excitations and elastic scattering processes [31-33]. The slowing-down histories for primary and secondary electrons are described until the energy falls to 7.4 eV (electron excitation threshold of the water molecule) . The residual energy is considered to be absorbed locally. The doses from a single radioactive decay (S-values) for 67Cu and 47Sc were assessed in spheres of water density and compared with those previously calculated for 161Tb in the same spheres . The diameter of the spheres ranged from 5 mm to 10 µm, thus simulating micrometastases of various sizes and single tumor cells. The relative contribution from the different electron emissions (β- particles, CE, Auger electrons) was also assessed as previously described with 131I . In addition to S-values, we calculated the absorbed dose resulting from a uniform concentration of events (1 decay per µm3). Since 67Cu, 47Sc and 161Tb differ in the total amount of electron energy emitted per decay, the absorbed doses were compared after normalization over a fixed amount of energy released per unit of volume (1 MeV per µm3). If totally absorbed, this concentration would yield 160 Gy. Based on the total electron energy per decay (Table 1), the average number of decays per cubic micrometer (N) that releases 1 MeV of energy is: 6.65 for 67Cu, 6.16 for 47Sc and 4.94 for 161Tb. Assuming a complete physical decay, no biological elimination, and a tissue density of 1g/cm3, this corresponds to an activity concentration (A0 = N × ln2 / T) of: 20.71 MBq/g for 67Cu, 14.76 MBq/g for 47Sc and 5.74 MBq/g for 161Tb. Finally, we examined the spatial profile of energy deposits around a point source of 67Cu, 47Sc or 161Tb. Energy deposits (eV per decay) were studied inside concentric 10-µm-thick shells around the point source. S-values measured with the Monte-Carlo dose CELLDOSE are reported in Table 3. Results agreed (differences <10%) with those reported by Bardiès for 67Cu and 47Sc in spheres >20 µm using analytic methods based on scaled dose point kernel . Bardiès and colleagues did not report on smaller spheres and did not study Terbium-161. The relative contributions of β- particles, CE and Auger electrons are also reported in Table 3. In the case of 47Sc, almost all the absorbed dose was due to β- emission (>99% for all spheres). β- emission was also the main contributor to the doses delivered by 67Cu, with only modest contribution from CE and Auger electrons (10.1 to 29.3%). By contrast, 161Tb displayed a significant contribution from CE and Auger electrons. The combined contribution from 161Tb CE and Auger electrons to the total absorbed dose was 25.9% in the 5-mm sphere and reached 88.3% in the cell-sized 10-µm sphere (Table 3). When 1 MeV per µm3 was released, the absorbed dose in the 5-mm sphere was similar for the three radionuclides (146 to 149 Gy). The absorbed dose progressively decreased when the sphere size decreased, but the dose reduction was more abrupt for 67Cu and 47Sc than for 161Tb (Fig. 2). 161Tb was clearly superior to the other radionuclides for spheres with less than 1mm diameter. For example, in a 100-µm micrometastasis the absorbed dose was 24.1 Gy with 67Cu, 14.8 Gy with 47Sc and 44.5 Gy with 161Tb (Table 4). The largest dose difference was found in cell-sized spheres: in the 10-µm sphere, the doses delivered by 67Cu, 47Sc and 161Tb were 3.42 Gy, 1.74 Gy and 14.1 Gy, respectively (Table 4). S-values for 67Cu, 47Sc and 161Tb and contribution of the different electronic emissions. Absorbed dose from 67Cu, 47Sc, and 161Tb assuming a uniform concentration of the radionuclide. Data for 177Lu are shown for comparison. § The absorbed doses from 67Cu, 47Sc and 161Tb (dose for 1 MeV released per µm3) are divided by the doses from 177Lu, which is used as a reference. 177Lu data are taken from . Electron dose delivered by 67Cu, 47Sc and 161Tb (considering 1 MeV released per µm3) as a function of sphere size. The maximal value of 160 Gy/MeV/µm3 corresponds to total absorption. Patterns of energy deposit (keV per MeV released) of 47Sc and 161Tb over the first 500 µm around a point source. The energy deposited by 161Tb (per MeV released) was considerably higher than that deposited by the other radionuclides up to 30 µm around the point source (Fig. 3). This suggests that 161Tb would deliver a higher dose not only to the targeted cell, but also to its immediate neighbors. Beyond this distance, the differences in energy deposits leveled off: the radius within which 50% of the energy is deposited (R50) was 0.17 mm for 67Cu, 0.25 mm for 47Sc and 0.15 mm for 161Tb. The radius within which 90% of the emitted energy is deposited (R90) was 0.57 mm for 67Cu, 0.72 mm for 47Sc and 0.63 mm for 161Tb. In many cancers, the prognosis is linked to metastatic relapse, which may occur years after primary surgery [35-37]. Targeted radionuclide therapy may play a major role to treat occult micrometastases in high-risk patients or to eradicate minimal residual disease [2, 8-13]. Several preclinical and clinical studies suggest that radionuclide therapy is more effective when administered at an early stage of the disease [4,6,38,39], probably because the distribution of the radiopharmaceutical in tumors is still relatively homogeneous. However, radionuclides differ in their ability to irradiate micrometastases . In this study we assessed the relative effectiveness of three promising medium-energy β-emitters, i.e. 67Cu, 47Sc and 161Tb. Since the electron energy per decay of these three radionuclides differs, we assumed that 1 MeV was released per µm3. If totally absorbed, this energy would always yield a dose of 160 Gy. Absorbed doses of this magnitude were measured in macrometastases of neuroendocrine tumors in patients who responded to 177Lu-DOTATATE therapy . Smaller and more homogeneous tumors are expected to respond to lower doses. Our simulations showed that, for the three radionuclides, the doses delivered to a 5‑mm metastasis (146 to 149 Gy) were close to the dose that would result from total absorption. The doses decreased with sphere size, thus underscoring the fact that micrometastases are more difficult to irradiate effectively. 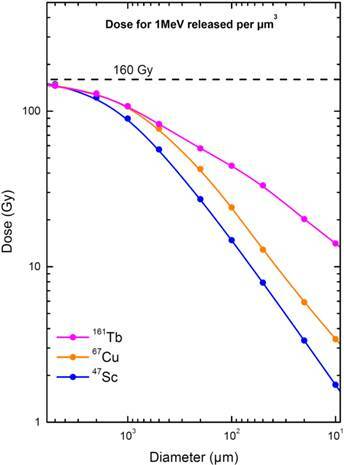 The dose delivered by 161Tb was however consistently higher than that delivered by the other radionuclides (Fig. 2). For example, in a 100-µm micrometastasis, the absorbed dose was 44.5 Gy for 161Tb, 24.1 Gy for 67Cu and 14.8 Gy for 47Sc (Table 4). The largest differences were found in the smallest spheres: in a cell-sized sphere of 10 µm diameter, the dose delivered by 161Tb was 14.1 Gy, compared to 3.42 Gy and 1.74 Gy for 67Cu and 47Sc. Thus, relatively to the almost pure β- emission of 47Sc, the doses delivered by 161Tb were ~3 times higher in a 100-µm micrometastasis and ~8 times higher in a 10-µm single cell (Table 4). In a previous work, we showed that the dose delivered by 161Tb to small metastases was also higher than that delivered by 177Lu . In Table 4, the absorbed doses from 67Cu, 47Sc and 161Tb (for 1 MeV released per µm3) are compared to those from 177Lu, used as a reference. Our Monte Carlo study provides a mechanistic framework that explains some recent preclinical findings on tumor-control efficacy [24,25]. Anti-L1CAM antibody labeled with 161Tb inhibited the growth of subcutaneous xenografts of ovarian cancer more effectively than the same antibody labeled with 177Lu and injected at a comparable activity (corresponding to 50% of the maximum tolerated dose) . In a cell culture study, the radioactivity concentration of folate conjugates required to achieve the half-maximal inhibition of KB cells (human cervical carcinoma) was 4.5 fold lower with the 161Tb-labeled conjugate than with the 177Lu-labeled conjugate . This difference was smaller (×1.7) for IGROV-1 cells (human ovarian carcinoma), which might be explained by the lower internalization rate of folate conjugates into these cells . The higher efficacy of 161Tb compared to 47Sc and 67Cu is mainly due to the larger amount of Auger and low-energy conversion electrons (Fig. 1), whose doses are deposited over relatively short distances (Fig. 4). 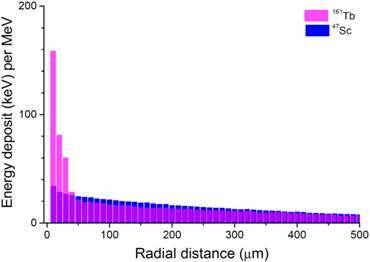 Indeed, CE and Auger electrons accounted for 71% of the radiation dose deposited by161Tb in a 100-µm metastasis and 88% of the dose deposited in a 10-µm cell (Table 3). This contrasts with 47Sc data, where >99% of the absorbed energy was due to β- particles for all spheres. The interpretation of experimental results may be further refined by considering the linear energy transfer (LET) of emitted electrons. Not only emission spectra from 161Tb are rich in Auger electrons, but also the majority of conversion electrons of 161Tb have low energy (< 50 keV) and thus high LET (Table 5). Two-dimensional plots of the tracks of two representative conversion electrons and two representative Auger electrons from 161Tb as simulated with CELLDOSE. Panel A reproduces the full path of the two CE (39.9 keV and 17.87 keV). Panel B is a magnification of the paths of Auger electrons (5.25 keV, 1.02 keV). The solid and open circles represent the ionizing interactions induced by the primary and the secondary electrons, respectively. 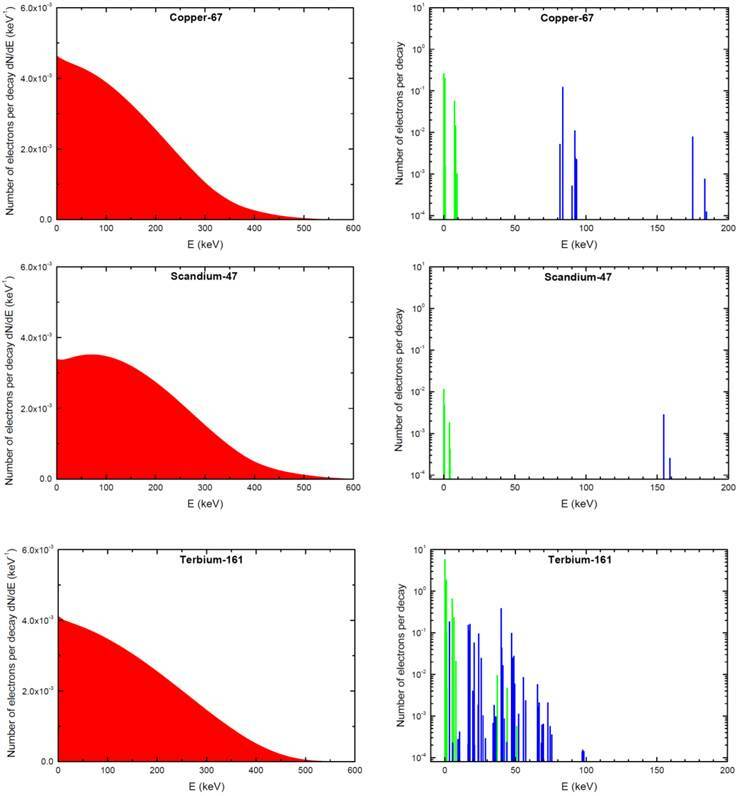 Comparison between 177Lu, 67Cu, 47Sc, and 161Tb: Energy released as Auger and conversion electrons per decay (keV) and its distribution within specific energy ranges. The linear energy transfer (LET) for each energy category is also shown. § LET values for electrons ≥10 keV are taken from the database ESTAR ; the other LET values are from Champion . The highest LET value is for electrons whose energy is close to 0.15 keV. Knowledge of the biodistribution of the radiopharmaceutical at the cellular and subcellular level is of paramount importance to rationally choose the most appropriate radionuclide. Radionuclides can be imaged and quantified with techniques such as autoradiography or secondary ion mass microscopy . This distribution may be used as input to derive the dose to tumor cells . The energy deposited by 161Tb (per MeV released) is higher than that deposited by the other radionuclides up to 30 µm around a point source (Fig. 3). Thus, 161Tb would likely deliver a higher dose, not only to the targeted cell, but also to its immediate neighbors. Moreover, the short tracks of energy deposit of Auger electrons and some low energy conversion electrons (Fig. 4) suggest that a putative 161Tb-labeled radiopharmaceutical would be even more effective if transported into the cell and internalized into the nucleus . The impact of Auger electrons on other targets such as the cell membrane also deserves investigation . Our future work will compare the dose distribution of 161Tb to that of other β-, Auger- or α-emitting radionuclides  for various cellular distributions. Also, since only limited preclinical work on 161Tb has been done so far [24,25], additional studies should be carried out to establish whether 161Tb is a good candidate for clinical use. Hopefully, preclinical data [24,25], and the theoretical framework provided by our own calculations, will encourage the development of new radiopharmaceuticals labelled with 161Tb. Finally, the choice of radionuclides for radiopharmaceutical therapy may be driven by logistic issues. Producing 67Cu as no-carrier-added in amounts suitable for large clinical use has been difficult [19,20]. The optimal technique to produce 47Sc is still debated [21,22]. Preliminary data suggest that 161Tb can be produced in large amounts as no-carrier-added, using for example a gadolinium-160 target (160Gd(n,γ)161Tb), and with good radionuclide purity (160Tb to 161Tb activity ratio <0.0001) . The cost for large-scale production is estimated to be comparable to that of no-carrier-added 177Lu . Radiopharmaceutical therapy can effectively target isolated tumor cells and occult micrometastases, provided that the optimal radionuclide is used. Our investigations on three theranostic radionuclides suggest that 161Tb might be a better choice than 67Cu or 47Sc. The promising characteristics of this radionuclide justify further preclinical investigations and, hopefully, clinical trials. We thank Pr. Keith Eckerman for helpful discussions regarding the ICRP-107 data files. This work was funded by the Institut National de la Santé et de la Recherche Médicale under contract PhysiCancer “MICRONAUTE project” and by the French Investment for the Future program within LabEx TRAIL ANR-10-LABX-57. Corresponding authors: Pr Christophe Champion, PhD. Centre d'Etudes Nucléaires de Bordeaux Gradignan, Chemin du Solarium, BP 120, 33175 Gradignan. Tel. : +33 557120896; Fax: +33 557120801 e-mail: championin2p3.fr Or Pr Elif Hindié, MD, PhD. Service de Médecine Nucléaire, Hôpital Haut-Lévêque, CHU de Bordeaux, 33604 Pessac, France. Tel: +(33)557656838; Fax: +(33)557656839 e-mail: elif.hindiefr.